WhatsApp began the public rollout of the group voice and video calling feature back in August last year, but making a group call was not exactly a simple process. WhatsApp for Android has now received a new update that introduces a dedicated call button in group chats – something that arrived for iPhone users last month. It can be used to make group calls by adding the participants all at once from a slide-out tray containing the contact card of all members in a group. 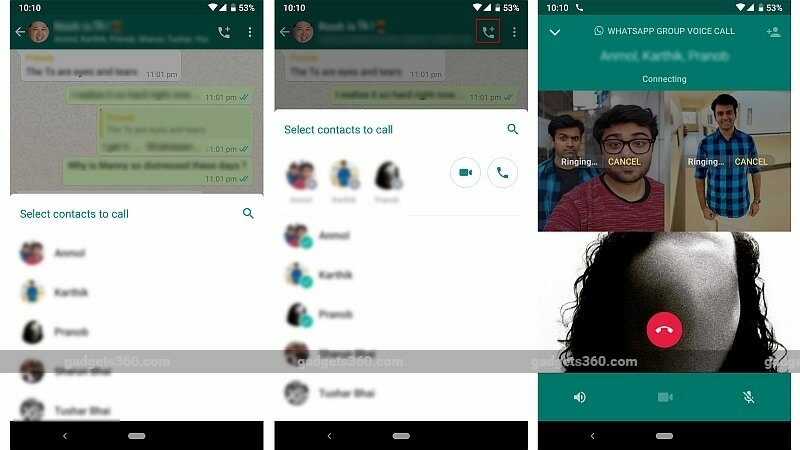 The new WhatsApp update for Android also fixes a bug which caused the GIF functionality to malfunction. The new WhatsApp version (v2.19.9) was first spotted by the folks over at WABetaInfo. So, how does this new call button prove to be helpful? Well, when the group calling feature first arrived on WhatsApp, one had to first start a voice or video call with a contact. Once the call was in progress, the caller was required to tap a button at the top-right corner of the screen to add another participant to the call. As soon as the call was connected, an ‘Add Person’ icon would appear at the top above the recipient’s name. Needless to say, it was a slightly cumbersome process. The new group call button added by the latest WhatsApp update makes it a lot easier to start a group video or voice call and was first spotted in a beta build back in November. As you can see in the screenshot above, there is now a dedicated button at the top right corner in group chats. Tapping on this button opens a slide-out tray which contains the contact cards of all group members. Here, you can tap on the names of people you want to participate in your group voice or video call. To download the latest stable version of WhatsApp for Android, visit the Google Play store or WhatsApp.com/Android. To recall, the new group call shortcut button arrived for iPhone users last month. It appears that the new group call button was not available on the app’s latest version downloaded from the official WhatsApp website. As for the GIF bug, it reportedly broke the GIF tab in the app, but it has now been fixed with the latest update.